Kone Mix by Atlas Plan, stone-effect slabs. Inspired by the ornamental beauty of the historical Ceppo di Grè stone. A porcelain stoneware solution that faithfully endows spaces with the timeless elegance of the typical Lombard stone, with its classic light grey colour featuring a decorative scattering of large fragments. Kone Mix is available in a matte finish with 2 thicknesses: 6 and 12 mm. The slabs can be used in both indoor and outdoor spaces and are ideal for: tables, islands, worktops, backsplashes, drawers, doors, side panels, bathroom vanity units, countertops, ventilated façades and bar and restaurant counters. 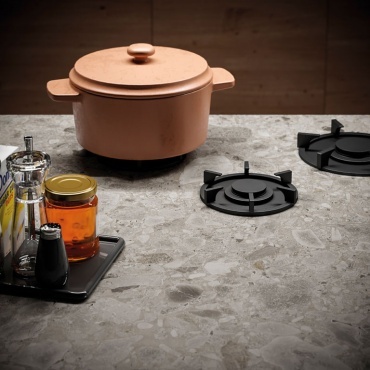 Kone Mix Habitat: Kone Mix matt slabs are paired with Kone Mix by Atlas Concorde for seamless aesthetic continuity. In contrast, dark-coloured inserts and materials in wood and metal endow spaces with a bolder, contemporary character.